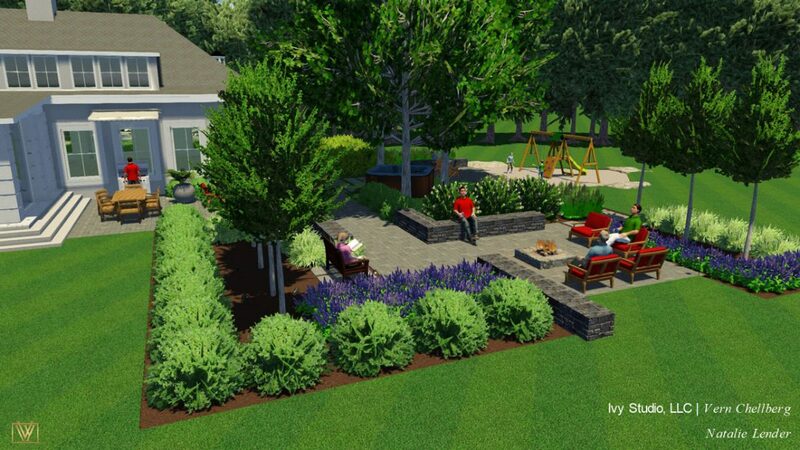 At IVY STUDIO LLC, a landscape design consulting firm based in Massachusetts, we focus on expanding your outdoor spaces and incorporate landscape designs into the overall project. As such, our design professionals keep abreast of the latest trends in garden and landscape designs and we will highlight some of these emerging, hot trends for 2018. Natural material selection– years of minimalist dominance in hardscape materials, furniture and décor are giving way to more natural material selections. Clients are yearning for a more organic look to their garden spaces. Swing style seating with natural tactile materials like wood and crushed stone are all the vogue now in place of the colder, modernistic look of concrete. Color blocking– a trend in fashion now finds its way into our gardens. Framing or highlighting a designated area with a color theme is a neat way to organize a garden and accentuates and frames a section of your outdoor room. Inexpensive and yet dramatic, even if no natural backdrop like a wall. You can substitute with solid outdoor screen or curtains or area rug. Locally sourced products– going local will continue to trend positively through 2018. Not only for plant materials, native and endemic plants that are native to a specific ecosystem, but hardscape materials as well. Climate change and the impact the changing environment has on a region, does drive design changes and the trend for regionally focused design will continue finding that delicate balance between environmentally sound natural elements and the client wants and needs. Locally sourced materials also reduce the carbon footprint. Lawn alternatives– expansive manicured lawns are taking a hit and alternatives are hot! Water shortages, fertilizers, pest controls and maintenance are all factors driving these changes. Not just a rise in artificial turf installations, but also grass mixtures that don’t need to be mowed, like a combination of meadow wild flowers and indigenous grasses. Out with monolithic style– now considered out of favor, mixing different styles, like in interior design is finding its place in outdoor gardens. Combining modern with traditional style elements creates a compelling and complex design aesthetic that is very effective. Mixing old and new and avoiding a mishmash can be accompanied through an intentional use of elements that contrast strongly with one particular style. Active places for kids– out with traditional wooden play structures and in with active play spaces integrated into the garden design. The idea is a free form digging and climbing area with plants, some vegetable and rocks to scale. Bringing technology into the garden– the use of high technology drip based irrigation systems delivering controlled water to each plant is part of the embrace of the low- watering landscaping trend. Contact us to learn how our design professionals can incorporate these trends into your landscape design project.